Purchasing SAFARI Montage MARC records will allow Destiny Library Manager (v.9.0 or later) users to search for SAFARI Montage titles, which are fully integrated in the search results. 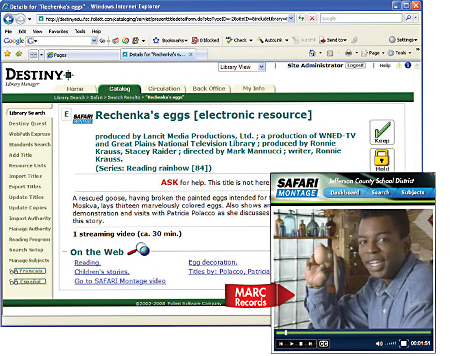 Links in the MARC record will take users directly to the titles to play in SAFARI Montage. These records can be modified with each school's local holdings in Destiny v.9.0 and later. The integration of SAFARI Montage and Destiny v.9.0 and later is free to SAFARI Montage and Destiny co-customers. However, MARC records for SAFARI Montage content packages with customized local holdings are available for purchase from SAFARI Montage. All MARC records include a URL link to the SAFARI Montage title on your system. When MARC records for SAFARI Montage titles are loaded into your Destiny v.9.0 and later system, those titles will appear in the search results, along with results for books, videos and links to other databases or web sites on the search topic. Users can narrow their search to only SAFARI Montage resources. A link to the SAFARI Montage video also appears in the title details. If the user is already logged into SAFARI Montage, clicking on the link will take the user directly to the title to play. MARC Records can also be purchased for other library automation systems. Destiny Library Manager™combines circulation, cataloging, searching, reporting and management in one centrally installed library software system. Please contact our Library Services Department at: 800-843-4549 or email MARCRecords@SAFARIMontage.com.